Maitland has been urging everyone to prepare to be self-sufficient for a year through me and Kent and longer through other mediums. It dawned on me that this can be an incredibly daunting task without specifics, so I thought I’d share a little bit of what I’ve done to get prepared starting with food storage and supply. 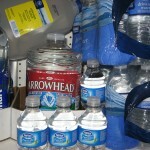 First, a caveat: I am not a food storage expert. However, I don’t think you or I have to be an expert to ensure our families are prepared. I have taken the “common sense” approach to having enough food and water to sustain Kent and myself for an extended period of time and am sharing my approach below. 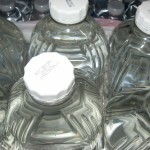 As recent disasters have proven, (e.g., Hurricane Katrina, Hurricane Sandy) it is typical for individuals to be responsible for meeting their own basic needs for food and water for days or even weeks after a wide-spread disaster because the overall impact of the disaster or emergency may be so great. The scenario I’m going to outline today involves being able to stay in our home, but we have no electricity. In a future post, I’ll outline the differences if required to abandon our home. We keep a fully stocked freezer at all times. A full freezer is more energy efficient to run and will keep the items in the freezer cold longer without electricity because the frozen mass is larger. If you know you’re going to lose electricity, you can stock a small cooler with essentials before the power is lost, so you don’t have to open/close the door (letting the cold air out) of the freezer after you lose power. If not, try to have your freezer well organized so that you can easily grab a few items and close the door quickly. The first foods you should consume after a power outage are highly perishable items such as meat and fish. Bread and vegetables can last longer without refrigeration and the risk of poisoning yourself is much lower with these items. The outside temperature will have an impact on the window of opportunity you have to eat from your freezer. Obviously if the weather is hot you will only have a short duration of time to safely eat the food from your freezer. After you’ve eaten what you can from the freezer, it’s time to move on to your canned and boxed storage. 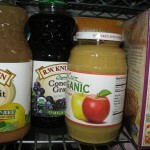 When stocking your pantry, consider food items that can be consumed without heat. Beans are a great source for protein and although you typically heat these, beans do not have to be heated to consume safely. 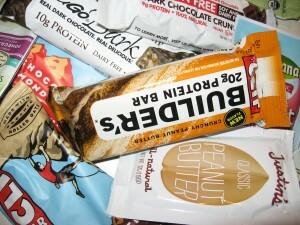 Nutrient dense snacks. 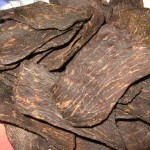 Stock lots of high quality snacks such as nuts, nut butters, protein bars, crackers, and jerky (only high quality real meat jerky). Concentrate on foods that will supply you with at least 3 grams of protein per serving. Protein shakes. 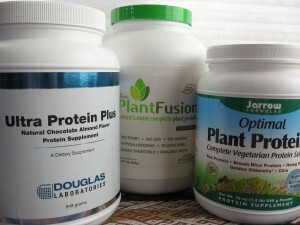 Easily hand mixed protein drinks will provide nutritional support to help sustain you during the days and weeks after an emergency, when other forms of protein (e.g., meat, fish, dairy) may not be as readily available. 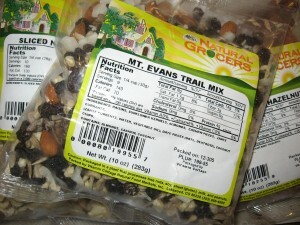 Canned or dried fruit helps break the monotony of beans at every meal. Non-potable water. I re-fill juice and water containers with tap water and store in the basement for use in washing our hands, dishes, etc. in case of emergency. Since this water has not been purified, its shelf life is not as long as professionally bottled water, but is still “safe” for other uses. I also stock hand sanitizer to ensure proper hygiene. Bottled, canned, and boxed beverages. 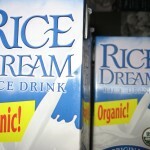 In addition to water, you should have other nutritious beverages that do not require immediate refrigeration on hand such as rice milk, broths, and juice. Consider beverages that will help keep you hydrated and will also provide you with additional nutrients to support you through the crisis. Gas grill with extra propane. Although you should not plan to cook every meal, you will want to have an easy method of cooking some of your meals, including raw meat, frozen pizza, etc. 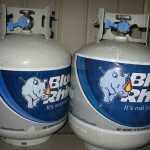 If you’re able to stay in your home, a gas grill is an easy alternative. In future posts, I’ll discuss other alternatives if you’re forced to leave your home. Stock up when food staples are on sale. An organic 15 oz can of beans can be as expensive as $2.50/can in my area, but on sale, I can find the same beans for $1/can. 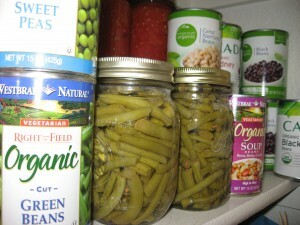 Buy food that you normally eat, so you can rotate your canned food storage regularly. Although beans are an excellent food staple in case of emergency, it is silly to buy cases of beans if you rarely eat this food in your normal daily life. Those are my suggestions for food storage. Please share your tips below.